A site-responsive project originating from a locality and evolving into a collection of jewellery identifying with the heritage of the site in an original and interesting manner. 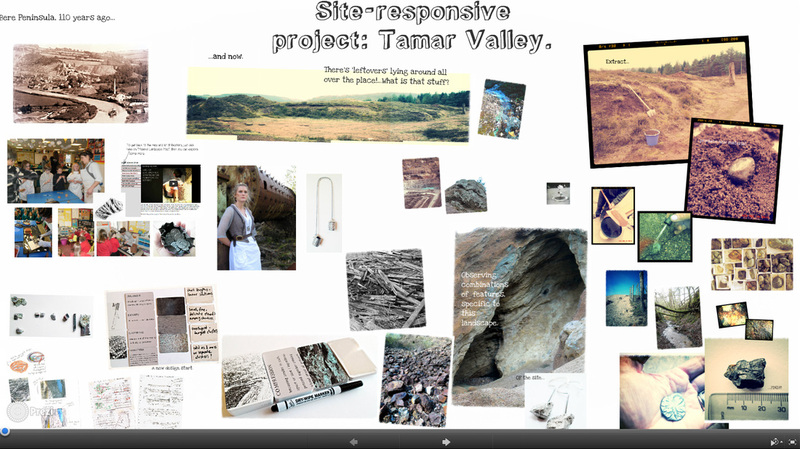 It questions and searches for an ‘essence’ that explicitly defines the mining district of the West Devon and Tamar Valley region and deals with this through an exploration of materials and processes. This work leads on from initial investigations into the materiality of the area. To find out more, read the Material Landscape Report. This was an interactive tour designed to accompany the Material Landscape project and exhibition. A kit containing visuals developed from site visits and selected design word definitions. Read the Material Landscape Report to find out more. A site-specific project originating from a landscape defined by the Anthropocene period. Hover over images to read any captions. To find out more, read the Waste Not report. A dynamic overview of the Material Landscape and Waste Not projects. Click here to begin the presentation - a full screen option is available. Portland Square in Plymouth is an area of the city which has been absorbed into the University Campus. This project explored the environs of the square in a variety of ways, resulting in a variety of objects. Hover over the slideshow images for captions and clickable links to detailed explanations, or read the Creative Processes Report. Flexible drape-walls explored with concrete-resin elements and laser cut plastic crochet patterns. Read the 5 Inbetween booklet to find out more.